Port Blair, Mar. 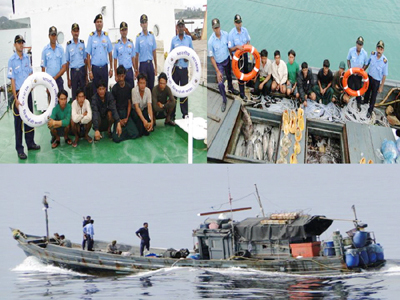 3: Indian Coast Guard Ship Bhikhaiji Cama in a swift operation successfully nabbed 06 Myanmarese poachers on a Thai Boat alongwith 500 Kg sea cucumber, 100 Kg Fish and 40 shells near Kondul Island during early hours of 01 Mar 13. The Ship under the command of Commandant Sanjay Negi, in a brilliantly executed operation involving hot pursuit for 02 hrs in the pitch dark night successfully captured poachers. The alert officer of the watch along with vigilant bridge team of ICGS Bhikhaiji Cama on surveillance mission in Southern Group of Islands observed an unlit contact at Radar 10 Nm North West of Great Nicobar Island moving suspiciously at around 0230 hrs on 28 Feb 13. The ship staff immediately moved to higher state of readiness and proceeded to investigate. On being challenged by fast approaching Coast Guard Ship, poacher’s boat increased their speed and commenced running to shallow waters. The strong winds, darkness and proximity from shallow waters were assisting poachers in evading CG ship. However, the ship tactically maneuvered to block the escape routes of poacher’s boat while maintaining navigational safety. Despite repeated calls made by the ship staff utilizing loud hailers directing them to stop, the poachers did not stop their boat. Finally, warning shots were fired by the ships marksmen compelling poachers to surrender. The apprehended boat along with 06 Myanmarese poachers were escorted to Campbell Bay and handed over to local police for further legal action. A communiqué received from the office of the Chief Operations Officer of the Coast Guard Regional Headquarters (A&N).